A new analysis by MIT researchers could make it possible to design more efficient artificial systems that mimic the way plants harvest the energy of sunlight through photosynthesis. The study is the latest in an ongoing series examining the process of photosynthesis and the different variables that determine its efficiency, conducted by Associate Professor of Chemistry Jianshu Cao and his postdocs and colleagues. The new work, which looks at artificial photosynthetic systems based on self-assembling molecules designed by researchers at of the University of California, Berkeley, follows a paper they published in October in the New Journal of Physics that examined the factors that determine the efficiency of natural photosynthesis. The hope, being pursued by various research teams around the world, is to be able to eventually produce synthetic chemical systems that mimic nature’s process of photosynthesis and thereby produce a more efficient way of harnessing the sun’s energy than today’s photovoltaic panels, and that can be used to produce some kind of fuel that can be stored and used when needed, eliminating the intermittency problems of solar power. Understanding how to maximize the efficiency of the process is one step toward being able to create such a system. The new research, by Cao and postdoctoral fellow Ji-Hyun Kim, found that there are many possible shapes that can be formed by bundles of chromophores — the reaction centers within molecules that actually absorb particles of light from the sun, or that transfer that energy or convert it into chemical forms that can be stored for later use. Among other configurations, the chromophores readily either adopt a helical shape (like a bedspring) or form a stack of disks. In their analysis, the stacked-disk configuration proved especially easy to fine-tune for optimal efficiency. There are three basic types of chromophores: acceptors, which absorb the light’s energy; donors, which emit light; and bridges, which transfer the energy from one reaction center to another. In systems composed mainly of donors and acceptors, the addition of extra bridges can greatly increase the efficiency of the process, the researchers found. In addition, specific ratios of acceptor to donor sites lead to the most efficient transfer of energy. Their findings were published in The Journal of Physical Chemistry, and the work was supported by the MIT Energy Initiative, the Singapore-MIT Alliance for Research and Technology, the National Science Foundation and the MIT Center for Excitonics. In the related work published last month, Cao, Class of 1942 Professor of Chemistry Robert Silbey, and their postdoctoral fellow, Jianlan Wu, had found that the efficiency of natural photosynthesis can be improved by adding just the right amount of noise — that is, random fluctuations. Since noise usually reduces efficiency, this finding was somewhat counter-intuitive. Adding more noise could also decrease the efficiency, they found. “There’s an optimum amount” of noise, Silbey explains, that produces the most efficient transfer of energy. To explain why a certain amount of noise could be helpful, he offers the analogy of friction from the road while driving a car. Of course, friction slows the car somewhat, thus decreasing efficiency, and with too much friction the car could grind to a halt. But if there were no friction at all — such as on a perfectly smooth icy surface — the wheels would just spin and the car would not move at all. There is an optimum amount of friction somewhere in the middle, and that’s also the case with noise in a photosynthetic system. In the case of photosynthesis, energy is being transferred from one part of the molecule to the next, and random environmental fluctuations — or noise — can add a push to the moving electrons carrying the energy and help propel them along, up to a point; but too much of this extra push can have the opposite effect, scattering the excitons so they are less likely to make it to the reaction center where that energy is harnessed. The specific photosynthetic systems the team studied included those from green sulfur bacteria, which have a very common type of multi-chromophoric aggregates that perform the energy conversion, Silbey says. While many teams of researchers have studied the way photosynthesis takes place in different plants, algae and bacteria, this work looked at the underlying quantum-mechanical processes and calculated how a variety of different variables affected the efficiency of the system, Cao says. “We think we have a very general picture of it now, that can be used for optimal design” of new, synthetic light-harvesting systems. This could allow fine-tuning of the timescales, temperatures and molecular configurations to get the maximum energy output from a given amount of sunlight. The search for general optimization in light-harvesting systems is currently being pursued by several other groups, including those of MIT professor of mechanical engineering Seth Lloyd, Alan Aspuru-Guzik of Harvard University, and Martin Plenio of Ulm, Germany. This theoretical analysis was triggered by experiments in the last few years, including those by Greg Engel, an assistant professor of chemistry at the University of Chicago, which demonstrated the quantum-mechanical basis for biological photosynthesis. “That’s what got the theorists all worked up,” Cao says, and led them to search for basic understandings that could lead to the most efficient possible systems. The next step will be for others to apply this understanding to the design of new synthetic systems. Any driver knows it can be hard to remain calm behind the wheel. But perhaps high-tech tools can help. A new study by MIT researchers, announced Thursday, suggests that driver-assistance technologies lower the amount of stress people feel when behind the wheel. The study, conducted over nine months by researchers in the MIT AgeLab in collaboration with the Ford Motor Company and the New England University Transportation Center (NEUTC), monitored drivers as they conducted two generally stress-inducing maneuvers: parallel parking, and backing out into cross-traffic in a parking garage. When using vehicles equipped with driver-assistance systems, however, drivers had lower heart rates, lower reported perceptions of stress, and in some cases operated vehicles more prudently, compared to the times when they operated vehicles entirely manually. The study involved 84 participants, balanced by age and gender, who were divided into two groups, one for each driver-assistance tool. One set of 42 subjects had to execute a dozen parallel-parking maneuvers each on Massachusetts city streets. They drove a Lincoln MKS equipped with Ford’s Active Park Assist tool, which uses cameras and sensors to gauge the size of parking spots, then automatically turns the steering wheel — without the driver touching it — as the car backs into a spot. While using Active Park Assist, the drivers’ heart rates were reduced by 12 beats per minute: they averaged 71 beats per minute, compared to an average of 83 beats per minute in the instances in which the drivers were asked to park without the tool. Moreover, the drivers’ subjective perceptions of their own stress levels, after parking, were 30 percent higher when they parked manually than when they used Active Park Assist. “That’s quite surprising and quite a large magnitude,” said Bryan Reimer, a research scientist in the AgeLab. The AgeLab, a multi-disciplinary research program based within MIT’s Engineering Systems Division and the Center for Transportation and Logistics, seeks to design and use innovations that can increase health and wellness throughout people’s lives. The NEUTC is sponsored by the United States Department of Transportation. Parallel parking, it turns out, produces a significant amount of fear and loathing among drivers. A poll conducted by Harris Interactive (and commissioned by Ford) shows that 31 percent of U.S. drivers avoid parallel parking whenever they can. The other driver-assistance tool in the study was Ford’s Cross-Traffic Alert system, which notifies drivers who are backing out of parking sports of oncoming vehicles, via a warning sound and light. In a Boston-area parking garage, drivers had to both use the Cross-Traffic Alert system, and back out without it, a half-dozen times each. Overall, drivers had heart rates and reported levels of stress that were reduced less than 5 percent when they were using the system, compared to driving manually, a modest decrease. However, drivers were 33 percent more likely to yield to oncoming traffic when using the Cross-Traffic Alert tool, reducing the potential for accidents. After a presentation by AgeLab and Ford researchers on Thursday, reporters tried out the Active Park Assist system on an MIT roadway, near the Wright Brothers Wind Tunnel. Under the guidance of Jarrod Orszulak, a research engineer in AgeLab, this driver activated the parking system by pressing a button, and — arms away from the wheel — let the car smoothly angle into a parking spot. Only one thing produced stress: some daydreaming pedestrians, a problem engineers probably cannot solve. Low-cost portable device developed at MIT wins major prize in Netherlands competition. One Earth Designs, a company spawned by an MIT student team to produce a low-cost portable solar cooker for use in developing countries, won the top prize last week in the Netherlands Green Challenge. Scot Frank ’08, who is CEO of the company, accepted the prize of 500,000 euros (about $667,000). The company will use the money to help scale up production of the solar cookers in China. The umbrella-shaped device, made of yak wool and a thin reflective coating, is expected to sell for about $13. 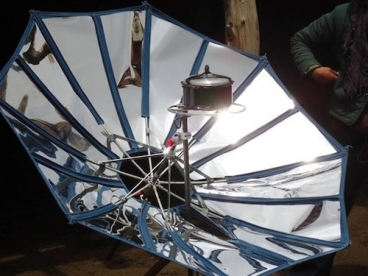 In addition to cooking food and boiling water, the portable device, which can be folded up and carried in a canvas bag, can be used to provide home heating and to generate power for lights or cellphones. The company has begun testing of energy use and air quality in 400 homes in Tibet to establish a baseline, after which it will test the impact of introducing the solar device to those homes. Most cooking and heating in the region is presently provided by burning wood and yak dung, which can cause serious problems of indoor air pollution, Frank says. Senior Amy Qian was the company’s chief engineer, and the team also includes other MIT alumnae, as well as students from Harvard and Wellesley. “I feel incredibly honored, on behalf of our whole team,” Frank said in accepting the prize from His Royal Highness Prince Friso of Orange-Nassau, the honorary jury chair. The prize will help to “make our dream come true,” he said. A team of MIT students has been working on testing a rapid-recharging system that could help to change public perceptions about electric vehicles and their practicality. They have already done extensive testing of the system with an individual battery cell and with a motorcycle they converted to all-electric operation, and in coming months they hope to be able to demonstrate the system on a full-sized sedan they converted. The goal is to demonstrate that recharging can be accomplished routinely in under 30 minutes without severely reducing the operating lifetime of the batteries or causing other problems. 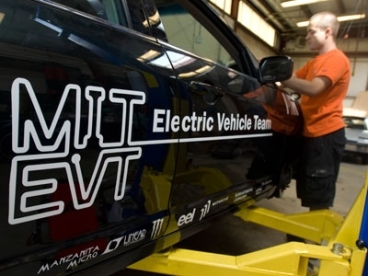 In the year since the MIT Electric Vehicle Team started working on the project, new and established companies have begun to offer commercial rapid-recharging systems, and Japan has officially adopted a new standard for the connectors for such systems and has begun installing the systems in more than 100 locations. The Nissan Leaf, a pure electric five-passenger car to be introduced in the U.S. later this year, is already capable of rapid recharging in 30 minutes in places that have the necessary “Level III” charging system. (So far, there is just one such station in the U.S., in Portland, Oregon). Next week, Lennon Rodgers, a doctoral student in mechanical engineering and a member of the MIT Electric Vehicle Team, will present a paper on the team’s rapid-charging tests at the 12th International Conference on Advanced Vehicle and Tire Technologies in Montreal. The paper was co-authored by fellow team members Radu Gogoana ’10, a master’s student in mechanical engineering, Paul Karplus (an undergraduate at Stanford) and Michael Nawrot ’11. Rapid charging, also known as Level III, requires much higher voltages and current than what is supplied by conventional household circuits. The Japanese rapid-charging standard, called CHAdeMO, provides DC power at up to 500 volts with a current of 125 amps. Typical chargers operate on standard AC power, using either 110 volt household current (Level I), which generally can recharge an electric car’s batteries overnight, or special systems (similar to those needed for electric stoves or clothes dryers) that use 220 volts (Level II), which can cut the charging time in half. “Rapid charging” systems typically refer to those that can charge the batteries to at least 80 percent of capacity within 30 minutes. Because of the large power requirements, this is not something you’d ever do in your home garage. Rather, this fast-recharge technology might be installed in central recharging stations comparable to today’s gas stations, where the cost of the necessary infrastructure could be warranted and where a fast turnaround is necessary. In many cases, rapid charging systems can provide a 50 percent charge — typically enough to travel 50 miles — in under 5 minutes, comparable to the time it takes to fill a gas tank. While rapid charging — largely being promoted by companies with long commercial experience with recharging industrial fork lifts and similar vehicles — is beginning to attract attention, there has been relatively little testing on the effects of repeated rapid charging on battery life and performance. “Is it damaging over time? That’s the issue we wanted to study,” says Rodgers. That’s the kind of data the MIT team was collecting in an attempt to prove the potential for this technology. Rodgers says that the chemistry used in lithium-ion batteries made by the MIT spinoff company A123 Systems is the best suited for rapid charging, and the company’s website declares that the batteries are capable of being fully recharged in 15 minutes. These batteries, based on research carried out at MIT in the lab of Yet-Ming Chiang, professor of materials science and engineering, have been selected for several planned new electric vehicles including cars from Fisker Automotive and buses and trucks from Daimler and Navistar. In the team’s tests, they ran one of these battery cells through 1,500 charge and discharge cycles, using an automated system. After 1,500 cycles, the battery had lost less than 10 percent of its initial power capacity, Rodgers says. The team used a fan to prevent overheating, which by stressing the chemical and mechanical components can lead to degradation. To test a rapid-charging system under realistic conditions, the team converted a motorcycle to all-electric operation, and then performed a successful rapid-charging test, reaching more than 80 percent charge within 10 minutes. The MIT EV Team has also completed the conversion of a 2010 Mercury Milan hybrid (donated by Ford) into a pure electric vehicle. The initial conversion was successfully completed last summer, and this summer they have been making major improvements — reinstalling the 8,000 lithium ion phosphate battery cells provided by A123, rewiring the system with a new control system, adding a powerful cooling system for the batteries, and making changes to make the car street-legal. They hope to use the car for testing of rapid charging technology, although they are still looking for funding to get the necessary equipment. Commercial rapid-charging systems can cost tens of thousands of dollars. For car designers, Rodgers says, there is a tradeoff they need to consider: They can include larger battery packs that provide a longer driving range, but are more difficult to recharge rapidly, or smaller packs that give a shorter range but cost less and can more easily be charged rapidly. In addition to analyzing battery performance, the team analyzed the impact that rapid charging of electric vehicles might have on the electric grid. They concluded that spikes of usage that might present problems for the grid could be eliminated by using an intermediate battery system. Instead of directly charging the vehicle from the grid, a large battery pack — perhaps using batteries recycled from other cars — could be slowly charged using a “trickle charge” from the grid, thus using low-cost, off-peak power, and then rapidly transfer its charge to the vehicle’s batteries.